It's not often that a third party software program could be considered a must have purchase for your Mac, however Toast for some time has been the exception to this rule. When it comes to burning, Toast has been the industry standard for any halfway serious user wanting to get the most out of their computer. 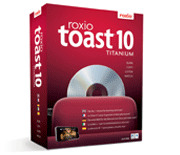 This version of Toast is number 10 and the edition that we got was the Titanium Pro. This is an extremely fully featured piece of software that to be honest I do believe that the average user will never actually take full advantage of. It is one of the best packages I have ever seen for a Mac however and as a person who dabbles in podcasting and video, this product was a real treat for me to use. For those of you who have Hi Definition capabilities, Toast is your product of choice as it can take that high definition video and put it onto a DVD that will play on most bluray players. This is a real treat that is going to start taking off in a big time once users discover all that locked footage on cameras can now finally come off without the expense of buying blank bluray media which is still rather expensive. Once costs come down I guess messing up a disc won't be that bad but at the moment it is an eighteen dollar mistake and one that most of us don't want to make. I love this product and the simplicity with which you can use the base program to create stunning results. The main interface is a drag and drop environment that allows you to choose the type of disc that you want to create whether it be a data disc, audio cd, or straight forward disc copy. There are multiple options for each area and all are very easy to use. The GUI for the software makes sure that regardless of your level of expertise you should be able to make whatever type of disc you need. The pro package comes with additional software that will make you slather with anticipation if you are wanting to get even more out of Toast. They are presented as extras on the install DVD and are more than worth your time and disc space in adding as apps to your computer. It's funny but this pro package contains so many worthwhile extras that each one of them almost deserves its very own separate review. We'd be here forever doing that so what I have decided to do is simply give you an overview quickly of what they do so you can be better informed about the package. Two things I do need to tell you about in addition to the everything else is that the installation whilst it's easy enough, it is a little on the messy side when you start to install all the extras that come with the package. Granted they are all on the one disc however the interface doesn't link them all together. you have to drag and double click your way through each application and input various keys and such. It would have made much more sense considering the cost of the package to have a simple graphic interface where you would check or uncheck the items you wanted to install to the computer and one key would work for them all as a package. As is now, don't lose your DVD dust jacket or you will lose access to quite a few programs. It is this install process that is the only ugly part of a stellar program. The next thing that I was kind of disappointed in was once I had installed the software and allowed updating via the internet, it told me there was an update waiting…. a 500MB download. Considering that in Australia we have download limits on almost all our internet packages and many small households only having a 1GB download limit, to have to download such a massive "update" was ridiculous. Other countries and the rich would not have issue with a download this size but the average punter would be shocked. Now for me, one of the things I loved about this software was the Soundsoap package. This great program cleans up any audio you have to throw at it. Old cassette tapes, LPs etc, just set yourself up to record and Soundsoap will get rid of any fuzzies you have, leaving you with pristine clean audio. Like the sound of vinyl but not scratched vinyl? No worries, just get Soundsoap to clean out the bits you don't like and leave in the ones that you do. If there is a persistent noise that is present in your home recordings that you need to remove, Soundsoap can "learn" noises to remove. It's pretty cool and I was very impressed. Fotomagico. The title said it all. Grab your favourite pictures and get them to tell their own story. The process is surprisingly intuitive and the results stunning. Even better considering that Toast can now burn to HD formats, you could even set up your presentation for BluRay or Hi Def DVD for playback on appropriate players. Once you have your pictures set up to your liking, it is truly a breeze to add images and sound and Fotomagico certainly helps with this. Once you are finished just export to Toast and away you go. Lightzone is the next cab off the rank and it provides you with a way of giving your pictures professional quality results. Considering the fact that so many of us now are budding amateur digital photographers and even the professionals rely increasingly upon software, Lightzone is a great way of lighting your pictures to your satisfaction after the shot is taken to get the result that YOU want. You don't have to be any sort of expert to utilise it and the menus are all pretty easy to understand. Lightzone understands most of the common digital photo formats including JPG, TiFF and RAW among others. Another thing that this package presents to you is finally a way for Mac users to get the files from their TIVO onto other media. For those of you not in the know, TIVO is a digital hard drive recording solution that you use to record free to air television but until now for Mac users there was no way to get the files off the hard drive of the TIVO machine, at least that I am aware of. Also you can send the files from your Mac effortlessly for playback through your TIVO. It's pretty darn cool. You still need to buy the Network kit from TIVO but you can now use the TIVO2MAC app that is included with Toast to transfer the files through your network. I am grateful that this application exists within this package but I must confess that this should be included by TIVO for the cost of the network kit. Neither option is cheap even though Toast is worth every cent and combined you almost pay double what Windows users pay for the same service. Once again once you input all the right codes etc, this application is pretty easy to use and most of you will have no problems. Almost anything you could imagine doing with data storage can be done with Toast. As a all in one solution, there is very little that could compete with it and its almost to good to be true interface. It is an honestly amazing product and one that I was very pleased to review. Ease of use and also the fact that it acknowledges that even though us Mac users know better, there are Windows users out there and you can burn your discs in formats that both Mac and PC understand, though I do find nowadays that most PC understand Mac burned discs though in the past that certainly was not the case which made work difficult in a mixed office. The ability to create Windows discs that autoplay is also a feature of the software amongst many others.